In addition to surveying Americans about their experiences with and exposure to race-related content on social media, Pew Research Center conducted a content analysis to examine how race is discussed on Twitter. The Center used the social analytics tool created by Crimson Hexagon to analyze the textual content from all publicly available posts on Twitter. The first case study focused on the timeframe of Jan. 1, 2015, to March 31, 2016. (For an in-depth explanation of how Crimson Hexagon’s tool works, see the methodology. This analysis determined that during those 15 months, there were a total of about 995 million tweets about race posted on Twitter. (A tweet was considered to be “about race” if it included an explicit reference to blacks, whites or the concept of race in general). That works out to an average of 66 million tweets per month and 2.1 million tweets per day. 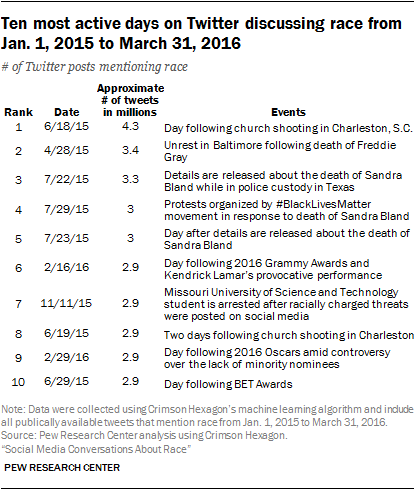 Indeed, no single day over that time had fewer than 1.5 million tweets mentioning racial issues. 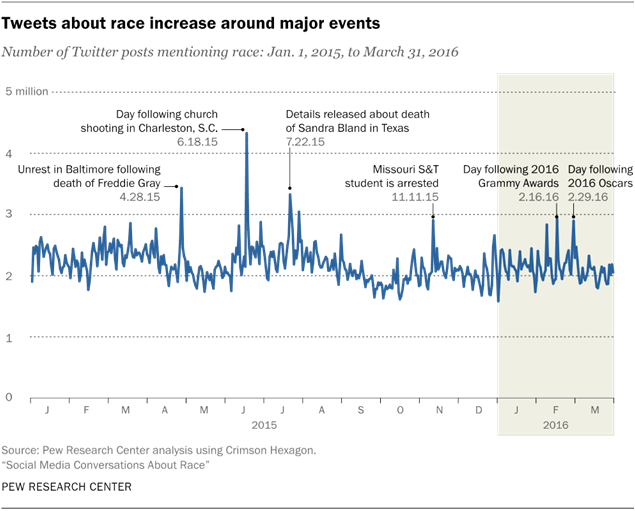 The analysis found that most of the largest race-focused conversations on Twitter during this period came the day following a major event – after people had time to process the event and formulate their reactions. Many of these moments involved incidents in which blacks were the victims of alleged police brutality or the targets of racially-charged violence. At the same time, several of the other largest conversations involved award shows or racial controversies more broadly. In this context, Twitter was more likely to be used as a place to respond to events and synthesize ideas than as a platform to report details of incidents as they occurred. For example, during the 15 months studied, the day with the most race-related conversation was June 18, 2015, one day after the mass shooting at a historically black church in Charleston, South Carolina. On that day, there were approximately 4.3 million tweets posted about race, more than double the 2.1 million tweets the previous day when the shooting occurred. Several of the other highpoints followed a similar pattern. The sixth-largest day was Feb. 16, 2016, one day after the 2016 Grammy Awards which featured a provocative performance by rapper Kendrick Lamar. The ninth largest was Feb. 29, 2016, one day after the 2016 Oscars, which took place amid the #OscarSoWhite backlash. The nearly one billion race-related posts on Twitter during this time period touched on a wide-ranging set of subjects, including social activism, pop culture and personal experiences. However, the majority of the racial conversation (60% of the tweets in total) was directly related to news and current events. Issues related to the police or judicial system made up an additional 7% of the conversation surrounding race. These tweets covered topics such as the death of Michael Brown in Ferguson, Missouri, and the #BlackLivesMatter movement. 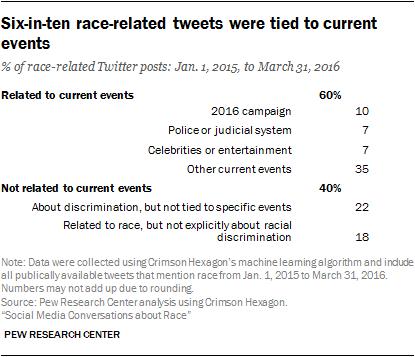 Discussions of race in the context of pop culture events accounted for 7% of the overall Twitter conversation around race. Some 35% of race-related posts on Twitter pertained to other events such as the video of University of Oklahoma fraternity members chanting racial slurs and the controversy surrounding NAACP-branch president Rachel Dolezal who was accused of lying about her race. The remaining 40% of the racially focused conversation on Twitter was not tied to specific current events, but rather to other subjects such as wider political themes or personal circumstances. Just over half of these tweets (representing 22% of all race-related posts) pertained to broad issues around discrimination, sometimes in a historical context. For example, on July 7, 2015, Congressman and civil rights activist John Lewis posted a message alongside a mugshot of himself from 1961. His post was retweeted more than 25,000 times.